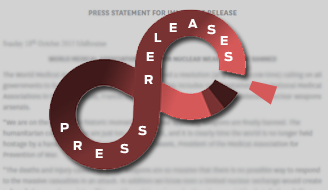 It is a truism that, just like any other piece of writing, the text in press releases has strengths and weaknesses. At the writing end, the drafting process prior to distribution will have been through many steps in pursuit of a ‘perfect’ piece of media communication. This will entail actions like debating the best headline to put on the release, how to effectively introduce key messages and in what order, who to attribute associated quotes to, the timing of the release and decisions about what additional facts and supporting information, including images, will best position the release to convert it from being passed over in a journalist’s inbox to actually gain traction and media exposure. At the receiving end the focus is typically a balance between a quick once-over of the quality of key elements of the release and a quick judgement related to its newsworthiness and utility value based on what the needs of the particular media publisher or broadcaster happen to be on any given day. Was my release headline a good hook for journalists? Did I elevate the most valuable content or angle to the beginning of the release? Was the release distributed to well-targeted media contacts? How can I improve my future releases? On top of this, a missing loop in the process has always been the absence of access to a neutral assessment of strengths and weaknesses of a release. Evaluating your own work isn’t always easy. We don’t know what we don’t know. Stemming from its years of research in the industry, AAP Medianet is filling that gap by establishing an in-house media team. With years of experience in both the writing end and receiving end of press releases, as professional communicators and working journalists, the team is helping to close the loop and provide value-add feedback which can contribute to better practice and continuous improvement. To be useful the purpose of the feedback process isn’t about detailed critiques or passing judgement on a release’s ultimate newsworthiness. Instead the focus is on running a ‘check back’ or light ruler over the basic structural elements that go into each and every release as a piece of writing. This includes making suggestions on obvious points to make the release as ‘fit for purpose’ and compelling to journalists as possible. Does the headline on the release hit the mark? Better still, is it compelling? Or is there room for improvement? Is the leading angle in the release well positioned? Does the release contain more than one angle to present multiple story opportunities to journalists and editors? Or is the story angle too hard to find quickly? We will continue to share our practice-based knowledge with you on different actions for moving your release along the continuum from average to effective to excellent. Check back in by bookmarking this blog to read our regular articles. * This article was contributed by AAP Medianet’s media team members, Stephen Olsen and Jason Loewenthal.